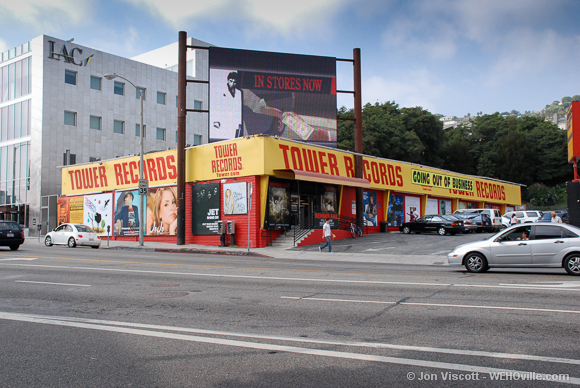 For 36 years, Tower Records was among the many music landmarks along the Sunset Strip. But did you know, 8801 Sunset Boulevard has a long, and storied history before Tower Records, including the site of where Earl “Madman” Muntz sold the very first car stereos? The site also was once home to a drive-in restaurant and showcase apartment for Shoreham Towers. In the next few pages, take a look at photos spanning much of the site’s history. Click below to see the site as Dolores Restaurant. It was THE place for the music scene in Los Angeles. The presence of a 2000s-era Lexus in the Muntz shot makes it obvious that’s not the site in the 1960s. Your photo is of the Muntz facility in Ventura, CA (at 2834 E Main St). The photo caption does not say that it was taken in the 1960s. As permanent as anything else in L.A.
Wow…I remember standing in line for hours to meet Oingo Boingo at their final meet-n-greet there. Drove all the way from Bakersfield.